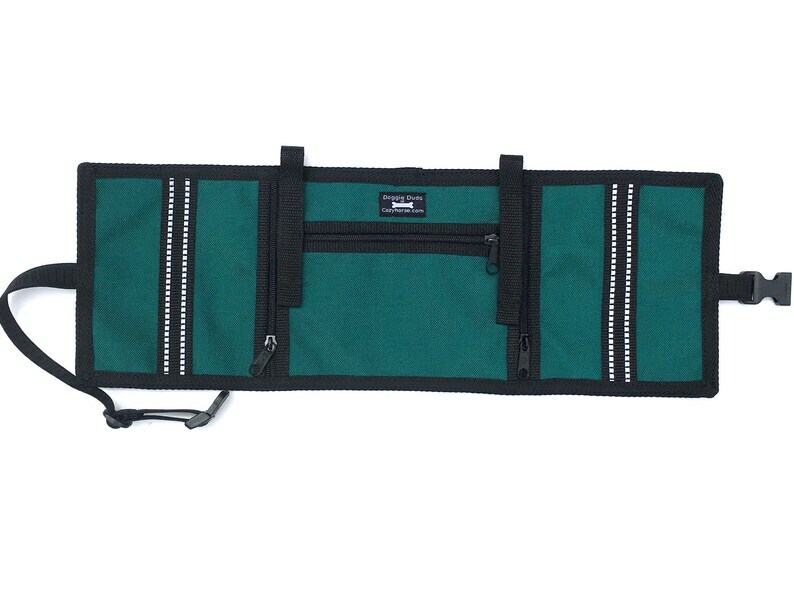 This listing is for a loop cape / vest that can attach to almost any Service Dog harness that has D rings. VEST ONLY! A HARNESS IS NOT INCLUDED! 3 zippered pockets that are the perfect size for medication bottles, cellphone, wallet, etc. The highly reflective stripes keep your dog visible at night. A nonrestrictive, elastic belly strap with a quick release buckle keeps the sides of this vest from flapping. Belly strap adjusts from 27" - 33" before stretching. Straps are set approx. 7" apart but do have some wiggle room. Please measure the distance between the D rings on your harness to find out if this vest will work for you. Color is teal with black trim. Compatible with harnesses like Activedogs (shown in pics), BLD, Finely Tooled, Yupcollars, DD, and many others that have D rings. The straps on this cape will also wrap around many nylon harnesses such as Coastal and Easywalker as long as the nylon isn't more than 1" wide. Modeled by my 45 lbs dog.